You do not have to be an advanced crocheter to crochet these hearts for Valentine's Day. A week or two ago I created a page with instructions on how to crochet the hearts you see pictured...this is a picture of my first attempt, and I share how I used them with my husband's Valentines gift. They are humble hearts, but have become nicer with more and more practice. There is a video tutorial as well. 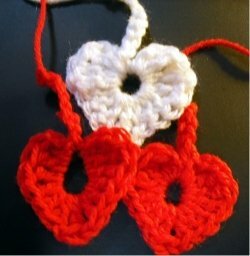 Please click here for the free pattern for easy to crochet Valentine's Hearts, or visit the "Crochet" link in the upper right margin for all of my free crochet patterns and tutorial pages.